New! For the 2019-2020 school year the Challenge will now include BOTH middle and high school levels. Minnesota students create original digital media campaigns informing the public about the impact of water quality on native mussels. 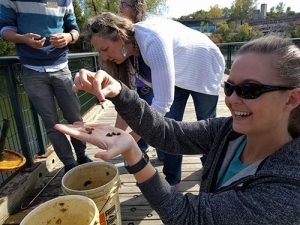 The school groups that get the message out to the most people will receive FREE field trips to the Minnesota Zoo including bussing, admission, parking and interactive sessions with our Mussel Conservation staff. For more information see the Frequently Asked Questions below or email us at [email protected]. To register for the Show Us Your Mussels Challenge, simply complete this form. What is the “Show Us Your Mussels” Challenge? Minnesota Middle and High School students create an original digital media campaign informing the public about the impact of water quality on native mussels. The school groups that get the message out to the most people will receive FREE field trips to the Minnesota Zoo including bussing, admission, parking and interactive sessions about our Mussel Conservation program. Why should we participate in the challenge? Almost half of Minnesota’s native freshwaters mussels are threatened are endangered of extinction. This project provides an opportunity to talk about these unique species while also addressing water quality in our area and seeking solutions. It also has interwoven an element of community service and local engagement. In addition, creating a digital media campaign can be a powerful hands-on strategy to help students highlight their science research projects, retain content knowledge and even increase learning goals. How is this project aligned to my curriculum? Is there any curriculum developed to support the Challenge? Yes! To access our Free Downloadable curriculum, click here. Is there any professional development to support the Challenge? Join us for a FREE Professional Development including behind the scenes peaks and tours of the Minnesota Zoo’s native freshwater mussel program. In addition to receiving CEUs and reimbursement for travel, participants will leave with more knowledge of these critically threatened species and resources to implement the Show Us Your Mussel Challenge for the 2019-2020 school year. Choose from two dates: Friday, September 27, 2019 from 10am to 2pm or Saturday, September 21, 2019 from 10am to 2pm. For more information email us at [email protected]. What other support do you provide for teachers doing the Challenge? Information about the Challenge and resources are continually updated via our Facebook page (MnZooEdu). Please follow-us! We also provide teachers with updates via email. Can members of your mussel conservation team come visit me at my school? If you are interested in us coming to your school to talk about the project and the information that the Zoo is doing in mussel conservation, we would be happy to visit if we are available. For more information, please email us at [email protected]. What types of projects can be created? The projects must be created and/or disseminated digitally. Examples may include online videos, websites, social media outreach, games, simulations, radio ads, etc. Specific resources have been developed to support teachers in developing and tracking YouTube videos, websites and Instagram campaigns. Besides having a digital component, the campaign must encourage community members to take some kind of action to improve water quality and conserve native mussel populations. Projects may be created by individual students or in small groups. Each school may have as many campaigns going on at the same time as they wish. Winning schools will be selected based on the total amount of votes that school receives and how many people are reached by the campaign. To see examples of 2018-2019 projects, click here. What are some best practices that students may choose to promote through their campaigns? Pet waste that washes off lawns and parks during rain and snow melt events contribute to harmful bacteria and nutrient contamination of our river water. Impaired water can become so bad that swimming is not recommended within 48 hours of a rainstorm. Help prevent this by always carrying bags to pick up pet waste and disposing of them in the trash or flush it down the toilet without the bag. Invasive zebra mussels that harm our native mussels attach to boat docks and boat hulls. If you use a boat, you can help prevent the spread of zebra mussels by removing all aquatic plants from the boat and trailer, draining all of the water from your boat and bait bucket, never dipping a bucket into a lake if the bucket contains water from another lake, and allowing your boat and trailer to dry in the sun for at least five days before using them in other waters. Winners will be selected based on two criteria: 1) number of votes received online and 2) number of people reached by the campaign. The Zoo will provide teachers with a link to embed in student projects. When a member of the public clicks on the link it will send them directly to the voting site. They will be prompted to answer two simple questions and vote for that school. Each person can vote once. Number of votes earned will be reported to schools weekly. The voting portion of the campaign will be open from February 3rd to March 2nd, 2020. As part of the project, students will be responsible for keeping track of how many people they reach through the campaign. This will mean counting likes, follows, shares, etc. and reporting them back through to the Zoo. Each student group will complete a reflection form which describes their project and its reach. Reflections forms must be completed by the end of the day on March 10, 2020. To register, fill out the simple form at the top of this webpage or email your name, name of school, grade level and number of students participating to [email protected]. Once registered, teachers can decide how/when to develop campaigns in their classrooms. However, the website for tracking votes will only be live from February 3rd to March 2nd, 2020. This is the timeframe where students will track how many people are reached through their campaign. What do the winning groups receive? Participants from the schools with the most votes will receive a FREE field trip to the Minnesota Zoo including bussing, parking and admission. They will also receive a behind the scenes tour of mussel conservation work at the Zoo. One grand prize winning school group will also be selected. In addition to a free field trip the participants from this school will be invited to do mussel work with our conservation team. They will also pitch their campaign to the marketing team at the Zoo. Winners will be announced by March 16, 2020. When will field trips occur for the winning schools? By the end of the 2020 School Year. The exact dates and times will be arranged with the Minnesota Zoo and the winning schools. December 20, 2019 Registration closes for the Challenge. End of January 2020 Teachers receive link to embed in student projects. February 3-March 2, 2020 Site is open for voting. March 10, 2020 Student reflection forms due to the Zoo via email. March 16, 2020 Winners contacted by the Zoo. April-June 2020 Field trips for winning schools.